- after checking the "Show a second drive" option, adding or editing a Qemu entry was problematic because the exe parameters edit area was too low positioned on window; also Qemu was not recognizing the second drive and refused to start. Both problems solved. - in the previous version when pressing F1 was directly loading "http://reboot.pro/to...chine-usb-boot/" in the default internet browser; also the last items from the context menu of the caption from the main window were directly loading their internet links. Now first checks for an internet connection, then tries if the default link works and, if not, tries a backup one. For example, the backup for F1 is "http://reboot.pro/in...showtopic=18736". If one of them works then it will be started in the default internet browser. I'm thinking about adding a few more predefined "command lines" for Qemu instead of just one. For example for VM's <> x86/x64. The user will choose each one with a checkbox in the Add/Edit window. What do you think, guys, will it be useful...? - when "use VBoxManage.exe command line (slower)" option is checked, VMUB waited about 5 sec so the previous VM session would be fully closed. For those of you who doesn't know why is it doing this: when you close and restart VirtualBox very fast, sometimes is crashing (VirtualBox bug). Those 5 sec may be too less on some systems or too much on other. So I found a way to check if its closed so it will only wait the amount of time that it needs. More, now it will show a progress window where you can see how it goes and where you can even stop the waiting (well, at your own risk). Changes from Beta 2: a small bug in the newly added code was fixed. Since not every user needs the sources of this program, they were not included in the main download anymore. VirtualBox 4.2.18 released 2 days ago. It's also strange that lately the update checker from VirtualBox Manager doesn't announce me about the new versions as soon as they are released. More, even if I try the main menu Help >> Check for updates still doesn't show a new version. Prior releasing VMUB 1.25 I tested it thoroughly with VB 4.2.16 and with 4.3.0 Beta 1. All was fine. It's again strange they suddenly decided to release VB 4.2.18 final even if the official Beta version was 4.3.0 Beta 1. But, again, that's probably just a coincidence. Anyway, it seems that 4.2.18 has sometimes problems with the "storageattach" command, failing to detach the vmdk. For those of you who doesn't know, there is no detach command; "VBoxManage.exe storageattach [GUID_of_the_VM] --storagectl IDE/SATA --port [n] --device [n] --medium none" command is used to set the medium to none. The problem appears when the USB drive is changed with another but having the same "physical drive number" as the previous. I will further investigate and come back with the results. BTW, this problem doesn't appear when you use "Method to update.. >> directly" in Options, because this way it doesn't use vboxmanage commands. So, if you have VB 4.2.18 and often change the USB drive, I advice you to use the "directly" method for the time being. 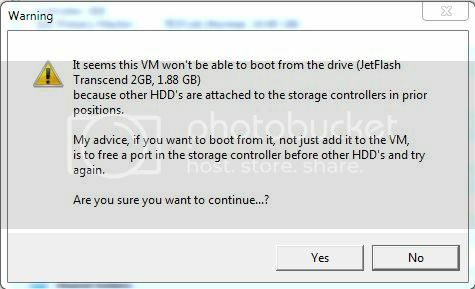 humm.. maby have anyone with anyone an deal for not adding some fiture like you VMS share it ..
but.... usb3 it is come anyway and it is 3times faster as sata .. or something.. so..
possibility for create an bootable usb or usb-harddisk bootable with an System .. i am not correct ? or i be wrong ? now they are in tight spot .. .. and to the others.. we are should spread this lil nice programm in all Freeware-Forums ..
Well, I came to the conclusion that the problem is not from my application and there isn't much I can do to avoid it. When vboxmanage.exe is called many times at some point it will refuse to do the job. It will wait 30 seconds and it will autoclose with exit code 1. It resembles somehow with the VirtualBox fast restart problem. When it works properly each job is done in about half a second. So I implemented a "waiting time to finish" of 15 seconds for each of them, which is enough even on slow computers. It's a little strange that they decided to set the autoclose time to 30 seconds. But, what is even more strange, the problem appears ONLY when vboxmanage.exe is called by another exe, not when it's started directly or from a batch file. how the hack it is call an other executable file in an other programminglanguage ? This it is the question like (like Juliet&Romeo) but both use an other language , you see..
Juliet speak Esperanto and Romeo Italiano .. but both loves, but dont relay understands..
maybe something like that .. both can kiss together, but can not really understand..
for review and check out what's directly the problem .. so we need an Programmer who can be an helping hand..
and i think, on this point want be go very interresting .. It could be from Delphi <> C/C++ but I doubt it. for really knowing why it works well there and not well there .. Anyway I advice you to use the "method to update.. >> directly" in Options and use the vboxmanage method only when is really necessary. Looks like in the latest Qemu version (compiled on 2013/09/21) the problem with the PhysicalDrive parameter is solved. 1. In Options: <<Add "Enable VT-x/AMD-V" option to the Add/Edit window">> in VirtualBox section. When it's checked it will add this option to the Add and Edit windows, with 4 states: Unchanged (default, it will not change the state of the option in the VirtualBox VM), On, Off and Switch. Switch will change the state (On to Off or Off to On) every time you (re)start the VM. 2. Some minor adjustments for VirtualBox 4.3.0 Beta 3. Edit: link removed, you can find a better version in the next posts. 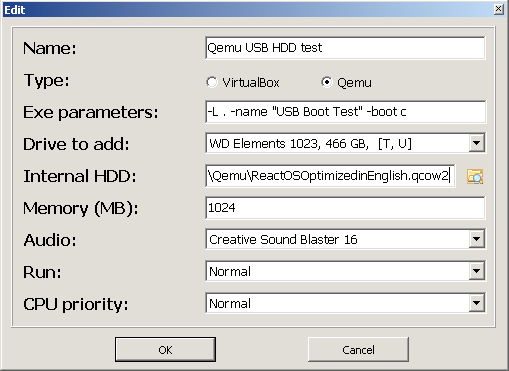 - for Qemu VMs now you can easily set a HDD image file as the internal HDD, memory size and a sound card (in the previous version(s) they could be set only with exe parameters). Edit: link removed, you can can find a better version in the next posts. 1. The Memory edit box from the Add/Edit window (Qemu VM) was changed to a spin edit box. 2. Small improvements to the way the application handles the input errors (from the user and VirtualBox configuration files). VirtualBox 4.3.0 was released, with a lot of improvements and bug fixes. And because the new version is slower (~ 2x) in closing its dependencies when the GUI is closed, looks like VMUB will have to wait a longer period of time to be fully closed. But this will affect the starting time only if the VM is (re)started right after closing it. i think, it's not so bad, because, the possible exist for take an USB-Device and installing an System on it. and if some start slower by restart it's not so important, the main thing is, it is possible to make the most important ..
but one (an anonym person/?s) want not, for add this gimmik into the VBox. And i think, it's the same reason why the VBoxManage.exe bug not be fix it ..
you have Show to be it is works on usb for using with an System and the download-numbers it prove that it is used. Hi DavidB, im jut starting to use Virtual Box 4.3 on my windows 7.
but it keeps telling error message "disk error.... press any key o restart"
any idea what i missed from this steps? Is the first disk storage port free? But if VirtualBox is saying it, it could be a faulty MBR or even a VirtualBox virtualization bug. For example it said that when I used WinToFlash + Windows XP SP3 onto my USB flash/stick. So, are you seeing the message in a small "message box" or in the VirtualBox VM window...? i've some troubleshoot when running virtual machine usb boot with virtual box. can you point me out step by step? The USB key/flash/stick is seen as a HDD when booting from a real or virtual computer. In most real computers you can select HDD boot order in Bios. Unfortunately in VirtualBox VM there isn't such an option. So you'll have to go into the VirtualBox's storage controller and set the HDD(s) from there (except VMUB***.vmdk, if you see one) to subsequent port(s). This way the VM will see the USB drive as the first HDD and it will boot from it. I could of explained how to do that in that message you've seen and/or in the VMUB presentation. I have chosen not to because this is a very important computer and VirtualBox knowledge and the best way to understand it is to search and solve it yourself, not just blindly follow my step by step instructions. In that message and in this one I have already gave you some pointers on how to (easily) solve it. But, since this is a forum where people are helped, if you (still) just want the step by step instructions, of course I'll help you with that. i'd love to if you can give me step by step instructions. i'm newbie in virtualization things. i'm trying figure it out by myself but i'm still stuck, cause i not familiar with the function of the menus in virtualbox. thx for your fast respond Davidb. i appreciate it. 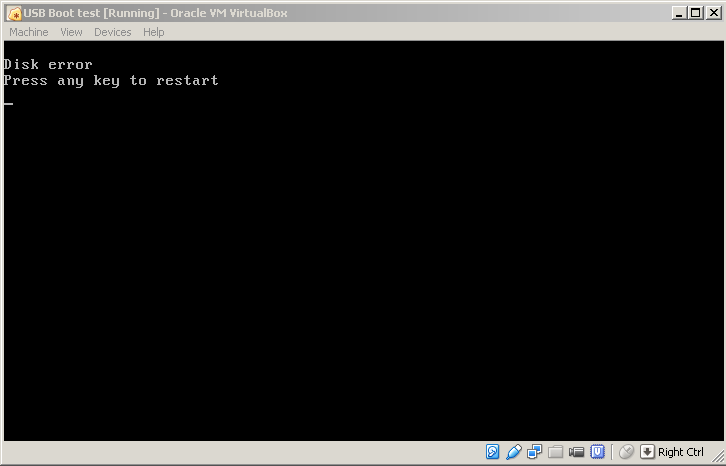 Start Oracle VM VirtualBox Manager. In the left panel select the VM used for USB Boot. In the right panel click on Storage (with the blue HDD icon). Any drive you see here (except VMUB***.vmdk) select it and look at Attributes in the right side. In the combobox (dropdown) you'll see the assigned port. Change it to a subsequent value; for example from IDE Primary Master to IDE Primary Slave or from SATA Port 0 to SATA Port 1. If you see a VMUB***.vmdk, assign the IDE Primary Master or SATA Port 0 to it. Click on OK, close Oracle VM VirtualBox Manager, wait a few seconds and start the VMUB.